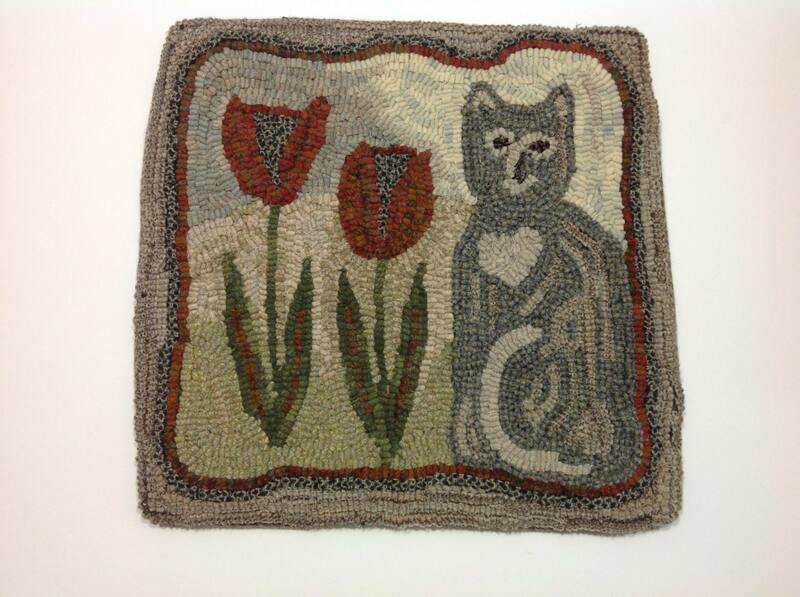 This listing is for the rug hooking PATTERN "Tulip the Cat", 14" x 14" on your choice of either cotton monks cloth or primitive linen. The rug in the photo is for display ONLY and is not for sale. 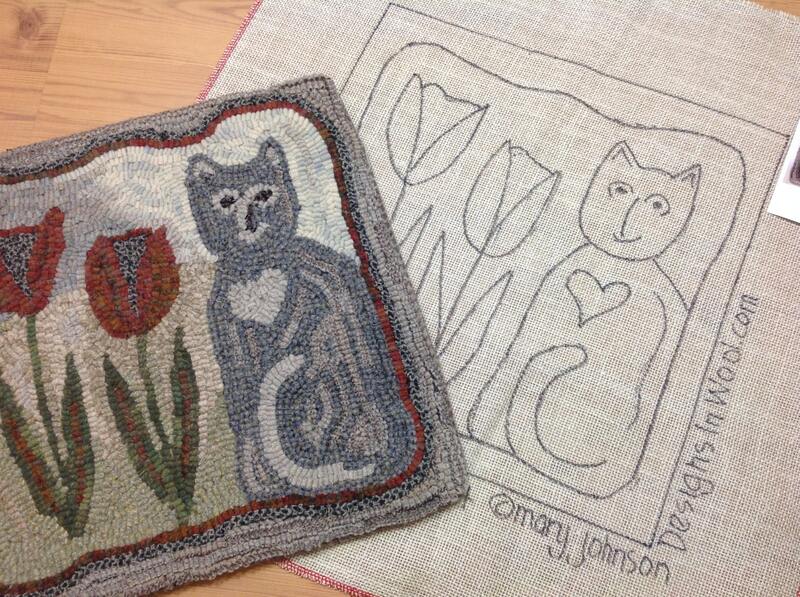 If you have learned how to hook or are planning on taking a workshop or class, this is a perfect beginner rug. It also is great for veteran rug hookers as it hooks up fast. It makes a great mat or wall hanging, but would be so cute as a pillow, too. The design is hand drawn on the backing fabric with permanent marker, leaving 4" inch borders on all sides. The raw edges of the pattern have been serged to prevent raveling. Monks cloth is good for all cuts from narrow to primitive #8 or #8.5 cuts. 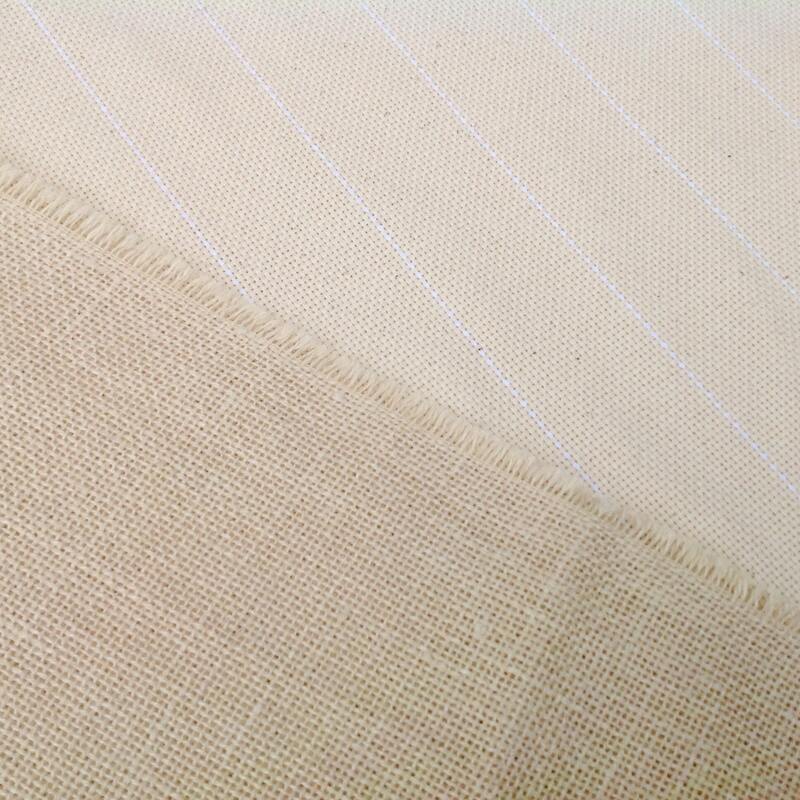 Primitive linen is great for all primitive and wide cut hooking including torn strips. 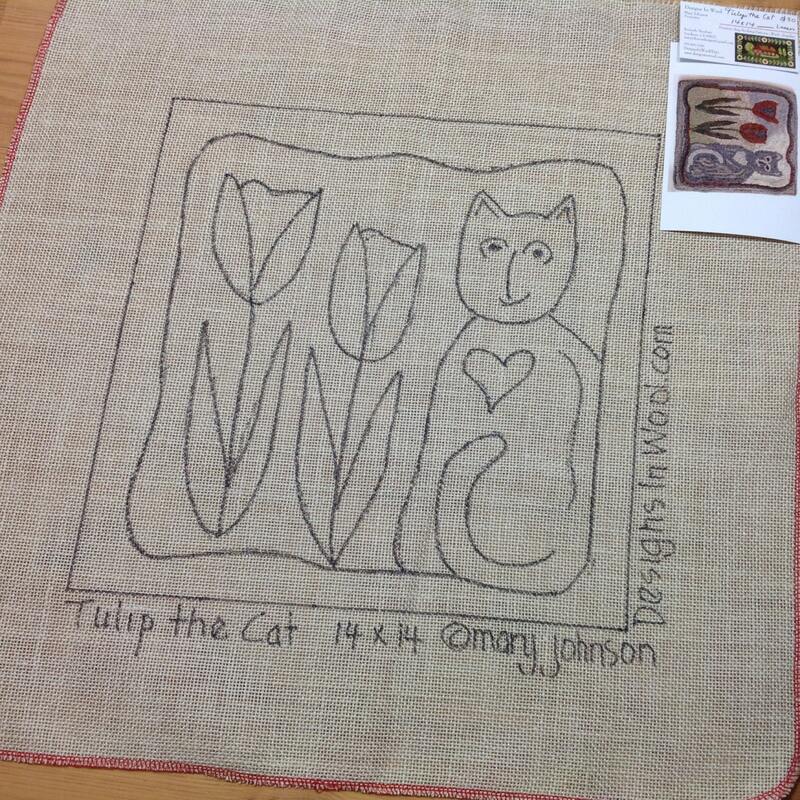 I hooked Tulip using a gray blue tiny texture with a mix of a gray stripe and oyster white accents. She is sitting next to her favorite flowers which were hooked with a rosey orange plaid. The tulip leaves are a hand dyed green mix with veins hooked with the flower wool. The mix of background colors from light green ground to light blue sky make an interesting mix. Thanks for visiting and please feel free to contact me if you have any questions. Designs In Wool studio is a smoke free, pet free environment. Designs In Wool accepts payment through Etsy Shop Payments using your preferred credit card or PayPal. Etsy keeps your payment information secure. My shop does not receive your credit card information. If there is a Coupon Event, you must apply the COUPON CODE in the "apply coupon" box at Checkout to receive the discount. Use the name specified in my newsletter or shop info box. California customers will be charged 8% sales tax. This charge will appear at time of checkout. Payment by check or money order can also be accepted. Please contact me if you would like to pay with a check. Your order will NOT be shipped until your check or money order has cleared my bank. Wool and Supplies are usually shipped within 1-3 business days. Hand drawn patterns usually take 3-5 business days to get ready to ship. If it should take longer than that, I will contact you immediately. Shipment is made using USPS 1st Class or Priority Mail depending on the weight, size and destination of your package. If you would like to upgrade, please email me before purchase and I can give you a shipping upgrade quote. USPS First Class is for packages up to 16 oz. in weight. It usually takes 4-7 days. USPS Priority Mail for packages weighing 1 lb and over. Packages usually arrive in 2-3 days. I will make every effort to ship your items at the most reasonable price. If you purchase multiple items and the shipping is $2.00 or more than the actual shipping, I will refund the difference back to your account. Please contact me about shipping outside of the United States. Shipping will be USPS First Class International up to 4 lbs and USPS International Priority Mail for heavier packages. Insurance is an additional cost. Buyers are responsible for any customs and import taxes that may apply. Buyer assumes all risk of non shipment. Shipping times vary by destination and may take 3-6 weeks for delivery. Designs In Wool is not responsible for delayed, lost or damaged packages. Designs In Wool wishes all customers to be 100% satisfied with their purchases. If you are not happy, please email me immediately. If you need to cancel an order, please contact me within the first day as I usually ship wool and supplies the next day (sometimes the same day). With my permission, you will be able to return items that are still in original state and packaging within ONE week of receiving the package. Once it is returned to my studio, and it is in original condition, I will refund your purchase to your account. You are responsible for all shipping costs. Special Orders, Wool Kits and Patterns that are Special Ordered and Wool that has been cut for rug hooking are not refundable. All designs, photographs and content are copyright materials and may not be reproduced or transferred in any manner without express permission from Mary Johnson. All designs and patterns purchased are for personal use only and may not be transferred, copied or given to others. Thank you for respecting the property and business of the artist. Please feel free to contact me about special orders by clicking on the "request a custom order" button. I have a lot of inventory that is not listed. If you are looking for a specific color or texture, I will be happy to check my inventory. If you are able to send a photo, that is a great help to me in understanding what you are looking for. Special Orders are non returnable. 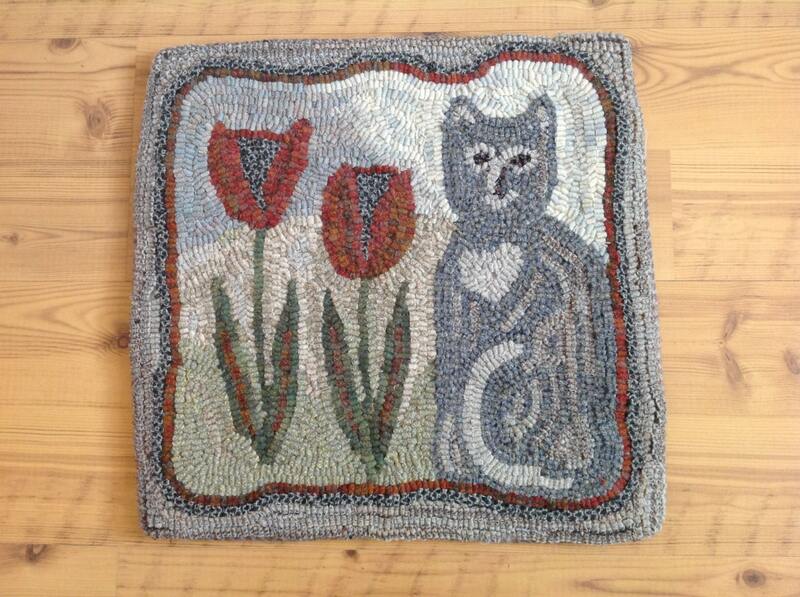 Wool Kits and Wool Packs that have been cut in strips for rug hooking are not refundable. Designs and patterns that have been customized and/or personalized cannot be returned. Which Backing Fabric should I choose? Cotton Monks Cloth is 100% cotton woven with two warp threads and two weft threads has 12 x 13 holes per inch. It is great for hooking with all cuts of wool, from fine to primitive cuts. It is less expensive than primitive linen. Primitive linen is 100% linen, the most durable backing fabric. It is more expensive than other backing fabrics. The evenly spaced weave of 12 x 12 threads per inch makes it great for all primitive cuts, #7 and wider. Beginnners usually have an easier time hooking with linen. Both are fine and long lasting choices for the backing to support and make your hooked rug durable. I use both types and enjoy working with both. Do you refund shipping overage charges? Yes, if the difference is $2.00 or more. Etsy calculations, especially on orders with multiple items, can add up to more than the actual shipping. I will let you know when your order is ready to ship if you will be receiving a shipping refund. All designs, photographs and content are copyright materials and may not be reproduced or transferred in any manner without express permission from Mary Johnson. All designs and patterns purchased are for personal one time use only. The purchased item may be given as a gift to another person, but may not be reproduced, transferred, redrawn or copied to give to others. Thank you for respecting the property and business of the artist. Can't wait to complete! Love designs from this vendor. lovely pattern, will hook soon I promise!